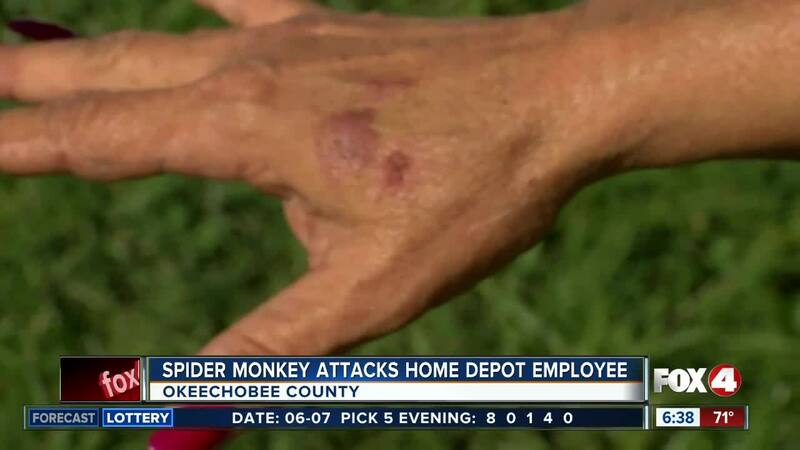 OKEECHOBEE COUNTY, Fla. — A Home Depot employee was attacked by a pet monkey after it escaped from a truck and wandered near the store entrance. Deputies say on Monday afternoon, a woman left her pet spider monkey in her truck while she went inside Home Depot. The monkey was on a leash but managed to get out of the vehicle. Marilyn Howard, an employee at the store, said she was in the break area outside the store when she heard her coworker yelling about a monkey, and thought it was a joke. Then she saw the monkey walking down the parking lot towards her and noticed it had a leash. She grabbed the leash and the monkey climbed onto her back and bit her twice. The monkey reportedly climbed down off her back, and she grabbed the leash again. She walked the monkey to the front of the store to see if she could locate the owner, but when the sliding glass door opened, the animal got scared and bit her on the arm and hand. It also scratched her on the cheek at one point. Howard refused medical attention, but said she would go to the hospital herself to be medically evaluated. Animal Control and FWC were contacted and arrived on scene to investigate.